Name Variation Kathryn O'Hara was also known as Katherine. Married Name 23 October 1938 As of 23 October 1938,her married name was Samuelson. Kathryn O'Hara was born on 14 March 1914 at Iowa. She was the daughter of Leonard Francis O'Hara and Catherine Agnes Friel. Kathryn O'Hara married Robert Leonard Samuelson on 23 October 1938 at Des Moines, Polk, Iowa. [S243] U.S. Federal Census 1920 U.S. Federal Census, by Ancestry.com, ED164. Dwelling 202. [S250] U.S. Federal Census 1930 U.S. Federal Census, by Ancestry.com, ED77-83. Dwelling 146. Leonard O'Hara was born on 2 August 1918 at Iowa. He was the son of Leonard Francis O'Hara and Catherine Agnes Friel. Leonard O'Hara died in 1942. Leonard O'Hara Joined with the Canadian R.A.F. Killed on his last mission as he was about to join with the American Forces since we had entered the war. David Lewis Bump was born on 4 August 1915 at Des Moines, Polk, Iowa. He was the son of Alda Bump and Bessie Hehn. David Lewis Bump married Harriett Grace O'Hara, daughter of Leonard Francis O'Hara and Catherine Agnes Friel, on 8 May 1936 at Des Moines, Polk, Iowa. David Lewis Bump died in June 1986 at 482-01-2168, Iowa, at age 70 last residence Urbandale, Polk, Iowa. George Welsh Jr. was born on 15 November 1902 at Iowa. He was the son of George W. Welsh and Mary Anne Friel. George Welsh Jr. died on 27 March 1916 at age 13. He was buried after 27 March 1916 at Laurel Hill Cemetery, Iowa. [S244] U.S. Federal Census 1910 U.S. Federal Census, by Ancestry.com, Year: 1910; Census Place: Des Moines Ward 5, Polk, Iowa; Roll: T624_420; Page: 4A; Enumeration District: 0144; FHL microfilm: 1374433. Name Variation Frederick Patrick Welsh was also known as Fred P.
Frederick Patrick Welsh was born on 28 January 1905 at Iowa. Frederick Patrick Welsh married Amanda E. Burger, daughter of Vernon E. Burger and Eva (? ), circa 1926. Frederick Patrick Welsh died on 14 October 1965 at age 60. He was buried on 16 October 1965 at Laurel Hill Cemetery, Des Moines, Polk, Iowa. 1 January 1925 Des Moines Ward 8, Polk, Iowa Frederick Patrick Welsh appeared on the census of 1 January 1925 in the household of George W. Welsh at Des Moines Ward 8, Polk, Iowa. [S250] U.S. Federal Census 1930 U.S. Federal Census, by Ancestry.com, Year: 1930; Census Place: Des Moines, Polk, Iowa; Roll: 677; Page: 12B; Enumeration District: 0085; Image: 377.0; FHL microfilm: 2340412. [S373] U.S. Federal Census 1940 U.S. Federal Census, by Ancestry.com, Year: 1940; Census Place: Des Moines, Polk, Iowa; Roll: T627_1197; Page: 8B; Enumeration District: 100-139. Helen Ruth Welsh was born on 30 May 1907 at Iowa. She was the daughter of George W. Welsh and Mary Anne Friel. Helen Ruth Welsh died on 20 September 1989 at age 82. 1 January 1925 Des Moines Ward 8, Polk, Iowa Helen Ruth Welsh appeared on the census of 1 January 1925 in the household of George W. Welsh at Des Moines Ward 8, Polk, Iowa. Mary Florine Welsh was born on 16 February 1912 at Iowa. Mary Florine Welsh died on 15 December 1939 at age 27. 1 January 1925 Des Moines Ward 8, Polk, Iowa Mary Florine Welsh appeared on the census of 1 January 1925 in the household of George W. Welsh at Des Moines Ward 8, Polk, Iowa. Richard Welsh was born on 20 January 1917. Richard Welsh died on 29 January 1917. Robert Leonard Samuelson was born on 2 December 1916 at Des Moines, IA. He married Kathryn O'Hara, daughter of Leonard Francis O'Hara and Catherine Agnes Friel, on 23 October 1938 at Des Moines, Polk, Iowa. Name Variation Clarence Clifford Ridgway was also known as Ridgeway. Clarence Clifford Ridgway was born on 18 December 1901 at Iowa. He was the son of John Newton Ridgway and Sarah Elizabeth O'Connell. Clarence Clifford Ridgway married Lucille Helen Bradley, daughter of (?) Bradley and (?) Crewes, on 30 January 1922. Clarence Clifford Ridgway obtained US Social Security Card at Iowa; last residence Oxnard, Ventura, California. In 1911 John and Sadie Ridgway at Greenwood Park with Clarence, Pearl and 6-month-old Grace. He migrated in 1932 at California. [S243] U.S. Federal Census 1920 U.S. Federal Census, by Ancestry.com, ED168. Dwelling 59. Married Name January 1922 As of January 1922,her married name was Ridgway. Lucille Helen Bradley was born on 24 September 1905 at Iowa. Lucille Helen Bradley married Clarence Clifford Ridgway, son of John Newton Ridgway and Sarah Elizabeth O'Connell, on 30 January 1922. Lucille Helen Bradley obtained US Social Security Card at California; last residence Oxnard, Ventura, California. She migrated in 1932 at California. [S204] California Death Records (published), for Lucille Helen Ridgway. Jack Clarence Ridgway was born on 29 November 1922 at Iowa. He was the son of Clarence Clifford Ridgway and Lucille Helen Bradley. Jack Clarence Ridgway obtained US Social Security Card at California; last residence San Clemente, Orange, California. Clarence Clifford Ridgway witnessed the migration in 1932 at California. Name Variation Clara H. (?) was also known as Clara S. (?). Name Variation Clara H. (?) was also known as Clara M. (?). Married Name circa 1923 As of circa 1923,her married name was Hoadley. Clara H. (?) was born on 2 May 1880 at Pennsylvania. She married John Samuel Hoadley, son of George Washington Hoadley and Hannah Ann Fox, circa 1923. Clara H. (?) died on 23 December 1955 at age 75. She was buried after 23 December 1955 at Charles Evans Cemetery, Reading, Berks, Pennsylvania. In September 1945 at Boone, Iowa, Mr and Mrs George B Croxen returned from vacation, and hosted her aunt and uncle Mr and Mrs J. S. Hoadley. [S250] U.S. Federal Census 1930 U.S. Federal Census, by Ancestry.com, ED6-47. Dwelling 292. [S373] U.S. Federal Census 1940 U.S. Federal Census, by Ancestry.com, Year: 1940; Census Place: Reading, Berks, Pennsylvania; Roll: T627_3681; Page: 4B; Enumeration District: 70-114. Name Variation Edward B. O'Hara was also known as Edwin. Edward B. O'Hara was born in November 1844 at New York also reported as Nov 1834; also reported as Ireland. He married Harriett Mary Denson circa 1872. Edward B. O'Hara died on 11 May 1926 at age 81. 6 June 1900 Joplin Ward 2, Jasper, Missouri Edward B. O'Hara was listed as the head of a family on the 1900 Census at Joplin Ward 2, Jasper, Missouri. [S244] U.S. Federal Census 1910 U.S. Federal Census, by Ancestry.com, ED171. Dwelling 23, 25. [S243] U.S. Federal Census 1920 U.S. Federal Census, by Ancestry.com, ED164. Dwelling 211. Name Variation Louis Edward O'Hara was also known as Lewis E.
Louis Edward O'Hara was born on 28 November 1876 at Iowa. He was the son of Edward B. O'Hara and Harriett Mary Denson. As of September 1918, Louis Edward O'Hara was never married. He died after April 1930. On 12 September 1918 at World War I Draft Registration, Des Moines City, Polk, Iowa. Name Variation James Bolivar Macy was also known as Jim. James Bolivar Macy was born on 23 February 1876 at Cambridge, Story, Iowa, death certificate listed birth as 12 Aug 1877. He was the son of Richard F. Macy and Isobel S. Davis. 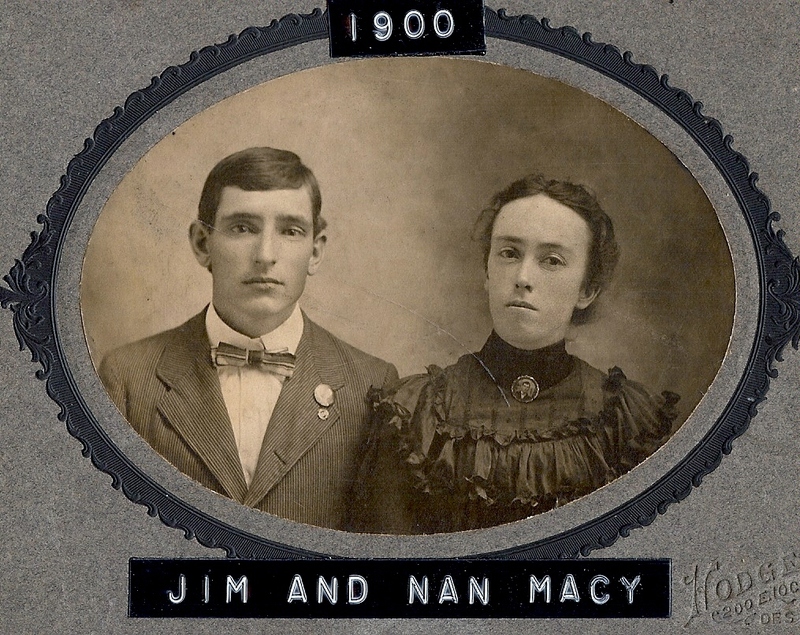 James Bolivar Macy married Mary Ann O'Connell, daughter of Dennis Francis O'Connell and Mary Coyle, on 13 August 1900 at Des Moines, Polk, Iowa. James Bolivar Macy died on 7 December 1922 at Des Moines, Polk, Iowa, at age 46. He was buried on 11 December 1922 at Lauren Hill Cemetery, Des Moines, Polk, Iowa. 1905 Polk, Iowa He appeared on the census of 1905 at Polk, Iowa. 1915 Des Moines, Polk, Iowa He appeared on the census of 1915 at Des Moines, Polk, Iowa, church affiliation listed as "none" for James and Bernice, and Catholic for Mary Ann. James Bolivar Macy witnessed the adoption of Bernice Elizabeth Macy before 1915. James Bolivar Macy was a miner in 1915. On 12 September 1918 at World War I Draft Registration, Des Moines, Polk, Iowa. [S246] U.S. Federal Census 1880 U.S. Federal Census, by Ancestry.com, ED208. Dwelling 143. [S245] U.S. Federal Census 1900 U.S. Federal Census, by Ancestry.com, ED66. Dwelling 493. [S244] U.S. Federal Census 1910 U.S. Federal Census, by Ancestry.com, ED161. Dwelling 107. Stamp 188. [S243] U.S. Federal Census 1920 U.S. Federal Census, by Ancestry.com, ED166. Dwelling 44. Hannah G. Whaley married William Whaley. Hannah G. Whaley was born in January 1857 at Rhode Island. She was the daughter of Christopher A. Whaley and Rosina Frieder. Huttenlocher. Hannah G. Whaley and William Whaley were divorced before 1900. Hannah G. Whaley died after April 1930. 1 January 1925 Des Moines Ward 8, Polk, Iowa She is listed as mother-in-law on the census of 1 January 1925 in the household of William Francis O'Connell at Des Moines Ward 8, Polk, Iowa. Hannah G. Whaley had 4 with 3 living in 1900 children. She had 4 with 3 living in 1910 children. [S248] U.S. Federal Census 1860 U.S. Federal Census, by Ancestry.com, Page 13. Dwelling 92. [S247] U.S. Federal Census 1870 U.S. Federal Census, by Ancestry.com, Page 54. Dwelling 437. [S246] U.S. Federal Census 1880 U.S. Federal Census, by Ancestry.com, NA Film Number T9-1211 Page Number 410C. [S245] U.S. Federal Census 1900 U.S. Federal Census, by Ancestry.com, ED92. Dwelling 312. [S244] U.S. Federal Census 1910 U.S. Federal Census, by Ancestry.com, ED150. Dwelling 11. [S243] U.S. Federal Census 1920 U.S. Federal Census, by Ancestry.com, ED154. Dwelling 9. [S250] U.S. Federal Census 1930 U.S. Federal Census, by Ancestry.com, ED77-84. Dwelling 180. William Whaley was born at Rhode Island. He married Hannah G. Whaley, daughter of Christopher A. Whaley and Rosina Frieder. Huttenlocher. William Whaley and Hannah G. Whaley were divorced before 1900. William Whaley died before 1930. Name Variation Christopher A. Whaley was also known as Chris. Christopher A. Whaley married Rosina Frieder. Huttenlocher at New York. Christopher A. Whaley was born circa 1826 at Rhode Island. Christopher A. Whaley was a sailor in 1870. Peter R. Whaley was born in July 1855 at Rhode Island. He was the son of Christopher A. Whaley and Rosina Frieder. Huttenlocher. As of 1930, Peter R. Whaley was never married. 1 January 1925 Des Moines Ward 8, Polk, Iowa Peter R. Whaley is listed as uncle-in-law on the census of 1 January 1925 in the household of William Francis O'Connell at Des Moines Ward 8, Polk, Iowa. Name Variation Nellie Kirfman was also known as Kirtman. Name Variation Nellie Kirfman was also known as Kirkman. Married Name circa 1902 As of circa 1902,her married name was Macy. Nellie Kirfman was born on 14 February 1885 at Des Moines, Polk, Iowa. She was the daughter of Jacob W. Kirfman and Mary M. Sherman. 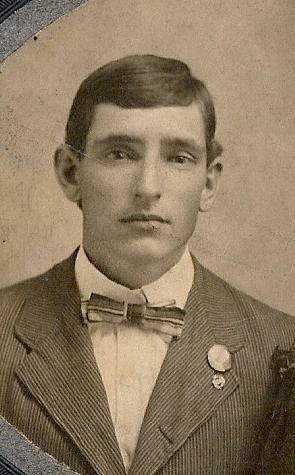 Nellie Kirfman married Cassius Archibald Macy, son of Richard F. Macy and Isobel S. Davis, circa 1902. Nellie Kirfman died on 3 August 1971 at Merced, California, at age 86. She was buried after 3 August 1971 at Evergreen Memorial Park, Merced, Merced, California. 1 January 1925 Des Moines Ward 7, Polk, Iowa Nellie Kirfman appeared on the census of 1 January 1925 in the household of Cassius Archibald Macy at Des Moines Ward 7, Polk, Iowa. Nellie Kirfman had 3 with 2 living in 1910 children. 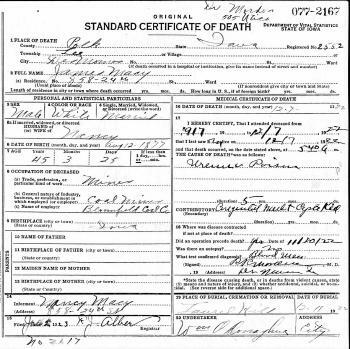 [S204] California Death Records (published), for Junior W. Macy. [S244] U.S. Federal Census 1910 U.S. Federal Census, by Ancestry.com, ED162. Dwelling 1. [S243] U.S. Federal Census 1920 U.S. Federal Census, by Ancestry.com, ED68. Dwelling 77. [S250] U.S. Federal Census 1930 U.S. Federal Census, by Ancestry.com, ED77-78. Dwelling 360. George Cassius Macy was born on 5 June 1904 at Iowa. He was the son of Cassius Archibald Macy and Nellie Kirfman. George Cassius Macy obtained US Social Security Card; as reported in California death index. Robert Donald Macy was born on 22 March 1909 at Iowa. Robert Donald Macy died on 5 October 1958 at Los Angeles, California, at age 49. 1 January 1925 Des Moines Ward 7, Polk, Iowa Robert Donald Macy appeared on the census of 1 January 1925 in the household of Cassius Archibald Macy at Des Moines Ward 7, Polk, Iowa. Arthur C. Macy was born on 7 February 1913 at Iowa. Arthur C. Macy married Dorothy Nadine (?) before June 1945. Arthur C. Macy died on 7 November 1991 at Merced, California, at age 78. He was buried after 7 November 1991 at Evergreen Memorial Park, Merced, Merced, California. 1 January 1925 Des Moines Ward 7, Polk, Iowa Arthur C. Macy appeared on the census of 1 January 1925 in the household of Cassius Archibald Macy at Des Moines Ward 7, Polk, Iowa. Married Name Her married name was unknown. Vera E. Macy was born circa 1915 at Iowa. She was the daughter of Cassius Archibald Macy and Nellie Kirfman. 1 January 1925 Des Moines Ward 7, Polk, Iowa Vera E. Macy appeared on the census of 1 January 1925 in the household of Cassius Archibald Macy at Des Moines Ward 7, Polk, Iowa. [S250] U.S. Federal Census 1930 U.S. Federal Census, by Ancestry.com, ED77-10. Dwelling 427. Married Name Her married name was Doak. Mildred Mary Macy was born on 4 August 1911 at Iowa. Mildred Mary Macy died on 26 May 1956 at Merced, California, at age 44. 1 January 1925 Des Moines Ward 7, Polk, Iowa Mildred Mary Macy appeared on the census of 1 January 1925 in the household of Cassius Archibald Macy at Des Moines Ward 7, Polk, Iowa. Betty L. Macy was born circa 1918 at Iowa. 1 January 1925 Des Moines Ward 7, Polk, Iowa Betty L. Macy appeared on the census of 1 January 1925 in the household of Cassius Archibald Macy at Des Moines Ward 7, Polk, Iowa. Married Name circa 1887 As of circa 1887,her married name was King. Married Name before 1920 As of before 1920,her married name was Macy. Addie Caroline Betts was born in 1872 at Iowa. She was the daughter of Henry Betts and Mary A. Bussles. Addie Caroline Betts married Joel King circa 1887. Addie Caroline Betts married George Alfred Macy, son of Richard F. Macy and Isobel S. Davis, before 1920. Addie Caroline Betts died in June 1955. [S243] U.S. Federal Census 1920 U.S. Federal Census, by Ancestry.com, ED79. Dwelling 42. Gilbert Macy was born on 5 February 1924 at Iowa. Gilbert Macy died in April 1974 at age 50. 1 January 1925 Des Moines Ward 7, Polk, Iowa Gilbert Macy appeared on the census of 1 January 1925 in the household of Cassius Archibald Macy at Des Moines Ward 7, Polk, Iowa. Gilbert Macy obtained US Social Security Card at Michigan; last residence Garden City, Wayne, Michigan. Junior Wayne Macy was born on 30 August 1927 at Iowa. Junior Wayne Macy obtained US Social Security Card at California; last residence Merced, Merced, California.